COPENHAGEN – Greenpeace strongly condemned the arrogance of the heads of state from the world¹s most powerful countries for presenting a ‘take it or leave¹ deal to the Copenhagen Climate Summit. Whilst en route to the airport they claimed the deal was done, it was not. All they left was chaos and confusion in their wake. Working through the night negotiators struggled to understand the status of the so called “Copenhagen Accord¹ as the Copenhagen Climate Summit came to an inglorious, incoherent and fiercely disputed close. The Copenhagen Accord is being hailed by some as a step forward. It is not. In fact it has not even been formally adopted by the Conference of the Parties (COP). It does not contain strong measures for emission reductions in developed countries. It is a major concession to climate polluting industries, especially in the fossil fuel sector which lobbied hard to undermine a deal and now has a license to continue to pollute. There are a few plus points, however, it provides for the establishment of a new Climate Funding Mechanism and agrees on the need of large scale finance, up to 100 billion dollars a year, to allow developing countries to protect their forest, to put their economies on a low carbon pathway and to help them adapt to the impacts of climate change. Furthermore developing countries agreed to take both voluntary action to reduce greenhouse gas emissions and to increase those actions if financial support was provided by developed countries. “Even as we welcome the establishment of the Climate Funding Mechanism that will provide positive incentives for the protection of forests, we regret the lack of deforestation reduction targets. This is a missed opportunity both for the forests and for the climate,” said Shailendra Yashwant, Greenpeace Southeast Asia Campaign Director. The conference did not agree a way forward to establish a legally binding agreement. 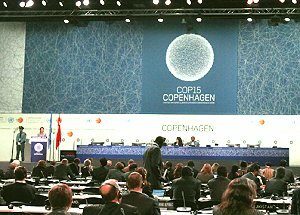 Although negotiations will continue next year, the loss of the ‘legally binding¹ objective made the Copenhagen Summit a huge missed opportunity. The world now has to resume the journey on the road from Bali to Mexico where a fair, ambitious and legally binding agreement to avert catastrophic climate change must be adopted. CAMP LUKBAN, Catbalogan, Samar – The Army’s 63rd Infantry Battalion successfully carried out their mission in an encounter against the terrorist rebels in Brgy. Cagmanaba, Jipapad, Eastern Samar on Wednesday afternoon. Report reaching to this headquarters by 1Lt. Josephus Emar M. Rempillo, public affairs officer of the aforesaid battalion disclosed that around 1:00 p.m. on December 9 while conducting security operations in the forested area of the afore-mentioned barangay, troops of “A” Coy under 1Lt Rodrigo C. Sinoy Jr. encountered some 20 NPA bandits under unknown leader who believed to be heading to said barangay for extortion activity. Accordingly, firefight lasted for about 15 minutes before the enemy was forced to withdraw upon sensing their inferiority. The said incident has resulted to the recovery of two M16 rifles, ammunitions, personal belongings and subversive documents. This also resulted to the killing of a terrorist whose identity is still being find out up to this press time and wounding more as evident in the bloodstains in the site of encounter. No casualty has reported in the government side. Meanwhile, Lt. Col. Arman Rico, 8ID’s spokesperson said that Maj. Gen. Arthur I. Tabaquero, commander of 8ID has already conveyed his congratulations to the 63IB for the successful implementation of ISO and the laudable feat in the pursuit of peace and development initiatives of the local government in their area. Lt. Col. Rico also said, the said success was the result of information being provided by the localities with regards to the terrorist activities in their area. “This is the result of the continuous information campaign being carried out by all Army units in our area of responsibility”, he added. Meanwhile, the 63IB is continuously conducting pursuit operations to track down the fleeing terrorist and let them face with their violations of the people’s rights in the said part of the region. QUEZON CITY – “The lifting of Presidential Proclamation 1959 is a manifestation of government’s sensitivities and full reliance on factual developments on the ground,” said ANAD Partylist Rep. Jun Alcover in reaction to the lifting of martial law in the province of Maguindanao, in the evening of Saturday (December 12, 2009). The Alliance for Nationalism and Democracy (ANAD) Partylist supports PP 1959’s imposition in the face of the so-called looming rebellion brought about by the total collapse in the delivery of basic and judicial services by the local government of that province, and the continued resistance by thousands of armed supporters of the Ampatuan family, a known political warlord in the area. “We, in ANAD, were all out in support of government’s initiative to restore public order, return of the delivery of basic services by government, and the justiciable resolution of the Nov. 22 massacre of 57 hapless civilians, including 30 media personalities, in Masalay, Maguindanao,” Rep. Alcover pointed out. “The lifting of PP 1959 or its imposition was a prerogative solely vested by the constitution on the country’s Chief Executive,” said Rep. Alcover even as he describes the petitioners against PP 1959 before the Supreme Court and the number of mass protest actions as grandstanding and hallowed noise. Rep. Alcover cited the fact that the short-lived martial rule, in Maguindanao, “clearly shows President Macapagal-Arroyo’s adeptness to the rule of law and resiliency towards factual happenings in the field. Here, the President has made an unequivocal statement of her commitment towards justice and truth which is directly in contrast to what her detractors had been saying, time and again,” Alcover added. On the continued tirades by Maoist terrorist sectoral front and pseudo partylist personalities even with the lifting of martial law, with a shrug of a shoulder, Alcover said, “What can we expect from these people? They always take up and make use of any issue against government to advance their lost cause. Maka-libre sila ng exposure, di ba?” Alcover quipped. “With the lifting of martial law, Congress should now focus on a number of vital bills, like the 2010 national budget and other pro-people measures, which our people needs,” he stressed. TACLOBAN CITY – Even has full operation and control has already been given to the local government of Kananga of the Kananga Municipal Hospital, the said facility would still be receiving financial aid from its former possessor – the provincial government of Leyte. With this, the hospital, fully turned over to the Kananga LGU in September, received anew financial assistance from the province amounting to P875,000 for the third quarter of this year. According to Kananga Mayor Elmer Codilla, though the province has relinquished its management and operation of the former community hospital, the provincial government through Gov. Carlos Jericho Petilla has committed to provide assistance to the hospital for a period of five years, which at such point would be enough time for the LGU to be financially stable for its operations. To recall, after many negotiations and convincing from the governor this year, Mayor Codilla finally gave his nod for the LGU to handle the management of the said community hospital against the alternative option of full closure since the said facility has not been earning much to support its own operations. “We looked for means to continue the operation of the hospital so that we can still provide a decent health facility for people from the western part of the province,” Mayor Codilla said. It was learned, the KMH gets an average of 46 patients a day and on peak days, such as Mondays, patients can number up to 98 a day. In 1991 the government introduced a major devolution of national government services, which included the first wave of health sector reform, through the introduction of the Local Government Code of 1991. The Code devolved basic services, to include health services among others, to local government units. Philippine President Gloria Macapagal-Arroyo signed the Proclamation No. 1959 on December 4. However, the justification is devoid of constitutionality as it is in contradiction to article 7 section 18 of the 1987 Philippine Constitution which states, "…the Constitution clearly requires that only in 'case of invasion or rebellion, when the public safety requires it' can martial law be declared,". The petitioners are urged to sign and leave comments online. The petition will be submitted to the Philippine Congress. The AHRC believes there was no overt acts of "invasion or rebellion" to justify this proclamation. The martial law was declared, not for reasons of suppressing rebellion, but to allow the police and the military to execute warrantless arrest and detention. By placing the province under martial law and suspending the privilege of the writ of habeas corpus the policemen and the military have been given a freehand to arrest, detain and conduct searches without court warrants. There have been arrests of the Ampatuans, a powerful political clan accused of masterminding the Maguindanao massacre, and their supporters, but there have also been arrests of persons who are then subject to questioning despite having no involvement in the massacre. Today, the two chambers of the Philippine Congress – the House of Senate and the House of Representatives – have begun deliberating on whether or not to revoke the martial law. CATBALOGAN CITY – This is the darkest day and infamy in the history of journalism in the Philippines. The entire community of journalists in the three provinces of Samar Island has joined hundreds of media organizations here and abroad in expressing outrage and condemnation over the gruesome fate suffered by their murdered colleagues when a political convoy was ambushed and slaughtered by gunmen in the Maguindanao province of Southern Philippines, Monday, November 23, this year. The Samar Island Press Club (SIPC), a legitimate media organization composed of members working for print, radio and televisions stations in North, West and East Samar has also demand speedy solution over this biggest single massacre of working journalists committed by beasts, bring to justice the guilty murderers with dispatch, without fear or favor. Starting today, members of the SIPC will wear a black t-shirt with “stop killing journalist” print, condemn in each radio programs and newspaper columns and will put a wide tarpaulin with full condemnation of this kind of “barbaric acts” against innocent civilians. “We, the members of the Samar Island Press Club (SIPC) from East, North and Western Provinces of Samar Island, condemn in its strongest possible term the recent massacre in the Province of Maguindanao that claimed more than 40 innocent lives in which more or less 15 of the victims are members of the media who were merely covering the event as part of their duty and obligation to the people of Maguindanao. This despicable and savage killings of the members of the Fourth Estate perpetrated in such a horrid and loathsome manner that can only be done by beasts and barbaric beings who have divested themselves of the tiniest semblance of humanity is not only a brazen affront to press freedom but shows lack of respect to human dignity and sanctity. We can only imagine the evil lurks in the hearts of these most vicious criminals! Clearly, their demonic masters who are behind this barbaric acts are sending us a message to spare them from exposing their evil and Godless acts against their so called "enemies" to shut up and zipped our mouth, close our eyes, and turned our ears deaf. But, they are wrong because we fear no one, we will continue to exercise our sworn in duty because that is where we exist, we will continue to expose and oppose ills in government bureaucracy. We will continue to fight those who would try to quell our God-given gift and our constitutionally enshrined democratic principles such as the Freedom of the Press, the rights of the people to information, and the right of every person to redress grievances against the State. The SIPC call came after a political convoy of over 50 persons, composed of newsmen, lawyers, and other civilians was ambushed, beheaded and slaughtered by around 100 armed men in Maguindanao, Southern Philippines. Most of the victims were peppered with bullets and buried including their vehicles. Buluan vice mayor Esmael "Toto" Mangudadatu told ANC News that his wife, Genalyn, his sister, and some relatives were on their way to file a certificate of candidacy on his behalf when they were abducted. Mangudadatu is running for governor of Maguindanao. He said his wife called him at around 9:30 in the morning to say an armed group, supposedly of the Ampatuan clan, a political rival, flagged down their convoy on their way to Shariff Aguak town, where the election office of the province is located. As of yesterday, the police and military has taken over the whole province apparently to “build confident control measures.” All concerned government agencies has also been deployed in the area to help in the investigations and control peace and order situation in the area. TACLOBAN CITY – At least 44 high school students benefits from the newly launched Aquaculture Training and Production training, started among three public secondary schools in Leyte, Leyte. The training course, called Income Creating Opportunities Technology-Project (ICOT-P) on Aquaculture Technology Course, is bankrolled by the provincial government of Leyte to provide livelihood skills to students who are unable to proceed to tertiary level of education and earn a degree. Leyte Gov. Carlos Jericho Petilla, who initiated the training program under his expanding ICOT-P training courses, led the opening of the ICOT Aquaculture Training and Production Center in Leyte town that covers more or less 10,000 square meters of fish pond apportioned for the aquaculture students. Already 7,000 square meters of the area have been developed where the students can grow their fish variety. During the recent inauguration at least 5,000 fish fry or fingerlings of different variety were spread into the constructed fish pond. The ICOT-P is a pro-poor project initiated by Gov. Petilla and is being implemented by the Provincial Government of Leyte. It focuses on graduating secondary level students who cannot pursue college education, by providing technology and skills transfer initially on modern agriculture and entrepreneurship, thereby creating opportunities for gainful income with the use of technology even without college education. With the success of the initial implementation in various public high schools in the province, the ICOT-P program has extented to the field of information technology when it offered the ICOT-P on IT program and providing them a venue for an IT training course throuh the ICOT-P on IT Data Center at the Leyte ICT Park in Palo. However, with yet another success story and graduating hundreds of high school students from various recipent schools, the program expanded this year to include aquaculture training and production among selected public high schools. ICOT-P is has become a landmark program of the provincial government, a milestone in its efforts to provide quality life for its constituents through community development, values formation and development and poverty alleviation. CATBALOGAN, Samar – To accommodate the land produce of hundreds of farmers from San Jorge, a new Bagsakan Center was formally opened Monday with Department of Agriculture - Regional Field Unit 08 (DA-RFU 08) Regional Director Leo Cañeda. The Bagsakan Center, the fifth in Samar province is one of the support facilities provided by the national government through DA which is intended to help the farmers. This will generate livelihood by giving them post-harvest and marketing facilities to market their produce and encourage them to produce surpluses instead of merely producing for their own consumption. Ms Concepcion Ursua, was assigned by Mayor Nancy Grey to manage the Bagsakan Center. With San Jorge’s agricultural land of 12,140 hectares, and a forest land of some 26,839 hectares based on her profile, farmers will be able to maximize the Bagsakan Center. One Maricar Martinez, a fish vendor for 15 years is grateful for the Bagsakan Center, at least here they will be organized. “Unlike before when we all had to bring tables for our items, today, we won’t have to do that, the stalls are tiled and look really neat and presentable“, beamed Martinez. Mayor Nancy Grey thanked DA for the opportunity. Just last week, DA launched The Farmers Scientist Training Program (FSTP) for corn farmers where close to a hundred farmers from San Jorge will benefit from it. Today, Grey was doubly grateful for another give-away – three mechanical dryers have been promised by Director Cañeda one for Barangay La Paz, another for Barangay Quezon and another for Northwestern Samar State University-San Jorge Campus. Farmers and buyers alike crowded the new Bagsakan Center as it virtually opened yesterday and sold items at reasonable prices. TACLOBAN CITY – Leyte’s western side welcomes the opening of a new P4 million worth local government run resort seen to boost the local tourism industry in the area. The Sibugay Mountain Resort in Sitio Soob, Poblacion, Albuera, Leyte is being poised to become an alternative eco-tourism resort and seen to create jobs and open livelihood opportunities. Leyte Governor Carlos Jericho Petilla, who recently led the inauguration rites of the resort, said investments in tourism yields more positive result if it comes from the private sector; however, in the case of the recently opened resort in Albuera, sans interested private investors coming in, the local government took the initiative and developed the resort themselves. Gov. Petilla otherwise lauded the project started by the local government of Albuera under Mayor Sixto dela Victoria for making the first move to further their growing tourism industry in the area. “Even in the midst of the global economic crisis, the tourism industry remains a key sector in generating jobs and various. That is why we have always encouraged the private sector and even the local government units themselves to put in their efforts towards advance this industry,” Gov. Petilla said during the inauguration rites. He likewise pointed out that tourism should not be promoted at the expense of the environment. The provincial government, he added, advocates promoting and carrying out environmental awareness and solid waste management programs to ensure the cleanliness and beauty of local tourist destinations. The governor noted that with the Sibugay Mountain Resort, the Albuera LGU has manage to package the resort as an eco-tourism destination, preserving the natural beauty of the environment with its lush mountain, green trees and clean flowing river. According to Mayor dela Victoria, the leisure pool they have constructed alongside the river complements the natural ambience of the place. Located more or less 2 kilometers away from the town proper of Albuera, the Sibugay Mountain Resort is accessible by motor ride from the poblacion to Sitio Soob at a fare rate of P10. The resort also offers low entrance fee pegged at P25 per head for any interested patron. Cottage fee range is from P200 to P300. With this amount, the resort’s pool and other amenities are all for free. Aside from the newly inaugurated mountain resort, Albuera also play host to another well-known resort – the Baybayon ni Agalon – which has become a favorite spot for local and foreign tourists visiting the province. TACLOBAN CITY – A comprehensive sports and education program is cooking up for Leyte through a good recruitment and training program that would scout potential athletes from different places in the province. Leyte Governor Carlos Jericho Petilla said to improve the provinces’, and subsequently the region’s, standing in national sports competition, there is a need to implement a good recruitment program that would provide championship caliber training for athletes with potentials. The governor further bared this would be a comprehensive sports and education program where the recruited athletes would simultaneously train and attend school at the expense of the provincial government. The pool of athletes who would be recruited under this program, it was learned, would be housed in one place where they would attend sports trainings under professional trainers and coaches and at the same time complete their school studies supervised by the Department of Education. The vacated rooms and spaces at the former Leyte Colleges adjacent to the Leyte Sports Development Center is being eyed as the area where these athletes can be housed for their training and studies complete with the provision of the appropriate training gears and an athlete’s nutritional diet. Meanwhile, the Leyte Sports Development Center, site of the Palarong Pambansa 2009, would be the training ground for these players, the governor added. Sports being eyed for the training program are athletics and swimming that carry most of the medal haul during sports competition. “Athletics and swimming comprise more or less fifty percent of the total medal tally in a sports competition such as Palaro, so these are the sport we are going to give focus first,” Gov. Petilla said.